Yesterday was the RBSC clubchampionship and this is one of the last races sailed in Belgium. We decided to lend our boats to 2 youth teams: Arnout & Klaas Viktor sailed Falcon BEL666 and Philippe Hendrickx and Gaeton Bols sailed Falcon USA208. 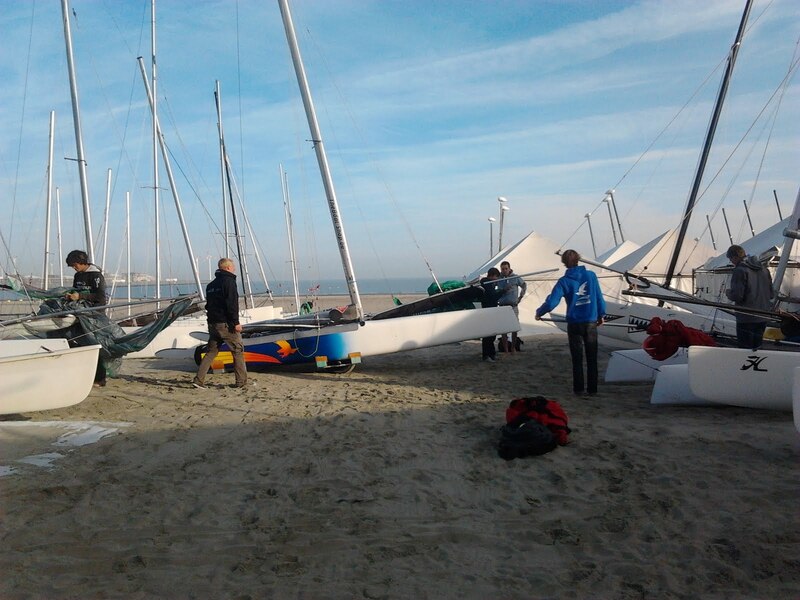 The day started early, 9 AM at the beach to rig the boats and to coach the youth with some light wind tips before they were of to the starting area. Emile De Moor sailed his Blade F16 together with Louis Verstraete, so 3 F16's getting ready in the morning, a very nice view! 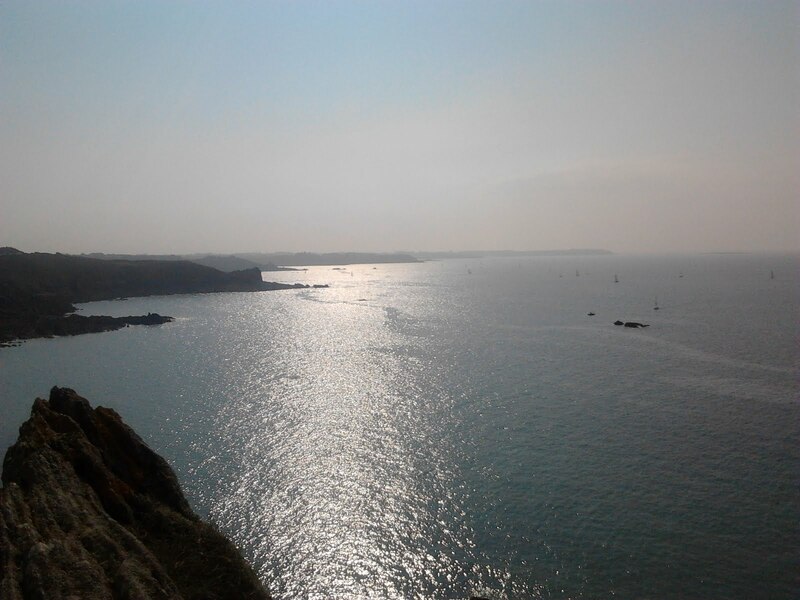 Sun was out and so were alot of boats! No less than 80 boats made the start. This included 60 cats (the other 20 were all yachts from RBSC Zeebrugge). Of the 60 catamarans there were 4 Dragoons battling it out in the youngest class. With the low winds (5 knots) and the heavy current they had the hardest time on the water. 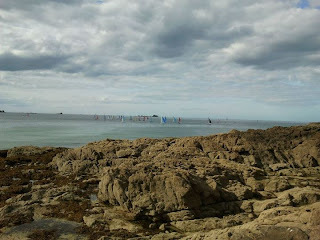 There were about 25 boats in both the C3 and C1 class. The C3 was crowded with youth teams. One of the teams was a youth team from our club, VVW Heist: Gilles Hendrickx and Filip Olyslager. They finished first youth on a third place in the C3! In the C1 the there was 1 youth team on an F18 and 3 youth teams on F16's! "Our youth" had been training the whole week in medium to heavy wind but they weren't too confident to sail light winds. Weighing 138 kgs Anout&Klaas were the heaviest of the three. In total 3 races were sailed in dying winds and increasing current. Clean air and not overstanding the layline was key but very difficult in these conditions. Because of all the training they did, the Falcon teams were off the line very well each time. It was great to see them battling it out in the front! With steady top 3 finishes it was clear that they had done great! They even came across the line first one time! Finally the prizes were given and they ended 1st and 3rd in the C1! Winning against some of the best Belgian teams. They were super proud! (and so were weI!). Great to see so much youth in the top 3, certainly in the 'dad' dominated C1 class! Full results and all pictures. Although we didn’t race this one ourselves, we think this is a great race, put it on your list! The organization is wonderful and the scenery magnificent. It was a tough job with the wind changing direction all the time and a heavy current, but I think everybody looks back at a great event. We let a French team sail our Falcon: Thierry Wibaux with his wife Christine. 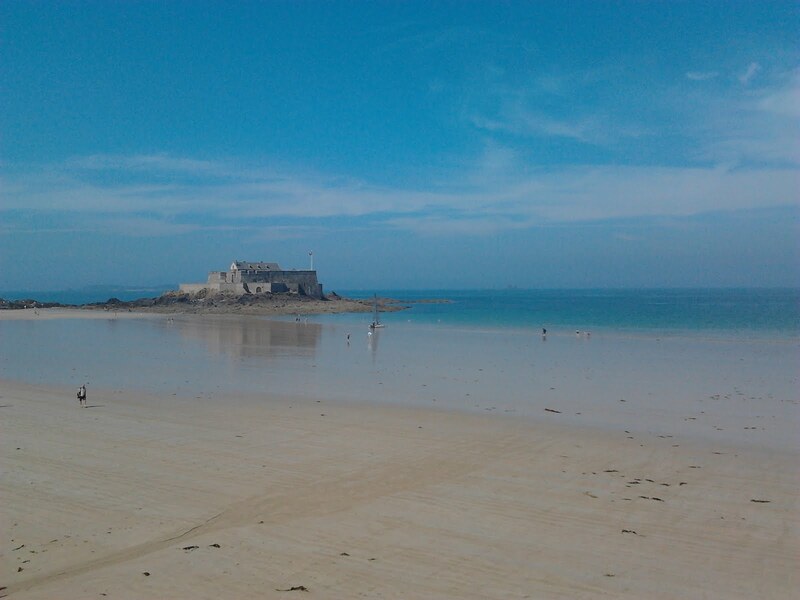 We arrived on Friday with beautiful weather (finally some sun in Europe!) and great ambiance. We took the car and drove from waypoint to waypoint checking the race from on top of the rocks or on the beach, a great day for us with great views of this big catamaran race. 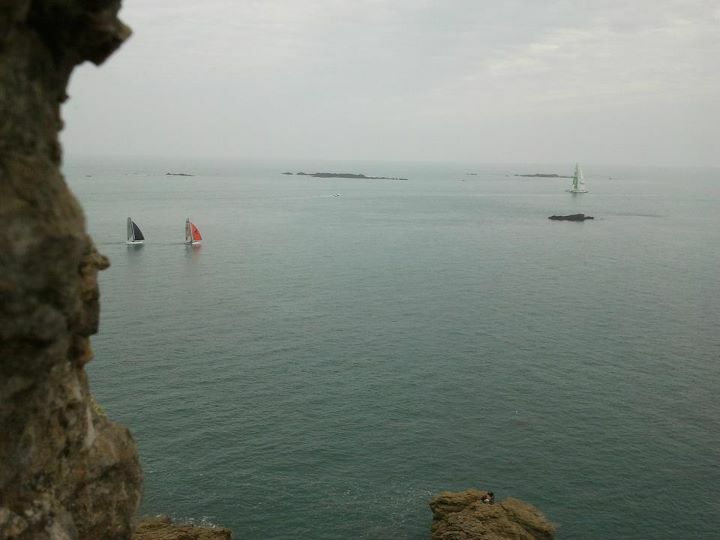 Lots of spectators followed this race too, it's truly a legend in the St Malo area. We ended the day with a great Paella diner and some fun lottery with very cool prizes. They do a great job with many voluntary staff. The diner (with nice free red and rosé wine :-)) was held in a large venue. To clean up the tables and chairs after diner they found a great incentive. They first showed a 7 minutes movie about day 1 at Raid des Corsaires and then after this movie they told all the participants they wanted the venue emptied in less then 7 minutes so everybody had to help. They showed the movie again and indeed once the movie was over the venue was all cleaned up thanks to the effort of all 130 teams! Nice work and they create a very friendly atmosphere like this. On Sunday it was blowing in the morning so racing was postponed. Thierry didn't start the first race as it was only the 5th hour on the boat and it was very windy just before the start. The second race of that day and the last one of the weekend we watched him from ashore and he had a great start, but then suddenly we saw him coming to a stop?! Some bad luck because his adjustable trapeze came loose, ouch :-). Eventually he was well in front of all the 16's, gaining a lot on the downwind run he said. Before the finish the wind dropped (and changed directions too, a very tough day of sailing wind wise again) and everyone came together again, so I'm not sure what the final results are (no official results yet). The F18's started 5 minutes after the C1 start and Misha Heemskerk took a huge lead on the downwind, even finishing in front of the F20! Everybody came back around 5 PM and an hour later we watched the price giving. The best 3 teams of each class (C1, F18 and C3) got a nice Sword as a price, very cool! Micha Heemskerk won the F18 and the F20 (Francis Ferrari) won the C1. 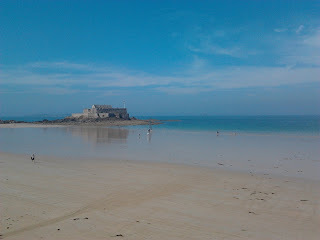 At 7PM we drove back home, tired but very happy after a great weekend at St-Malo! This is one of our favorite events. For Kathleen because she can win a little diamond (very little but she is saving them all to have – one day – a ring made of it) and in general because this is a compulsory mixed event. Since we are always sailing mixed we like this format a lot. With a total of 71 boats registered this was again a very successful race, organized by RBSC Zoute. Saturday announced to be a very light wind day, with predictions of force 2 to 3 with maybe a sea breeze coming in and making it a force 4 in the afternoon. Gill had hurt his back while biking (in fact he was texting and biking and he ran into a parked car, not so smart!) and up until Saturday morning we were not sure he would be able to participate. 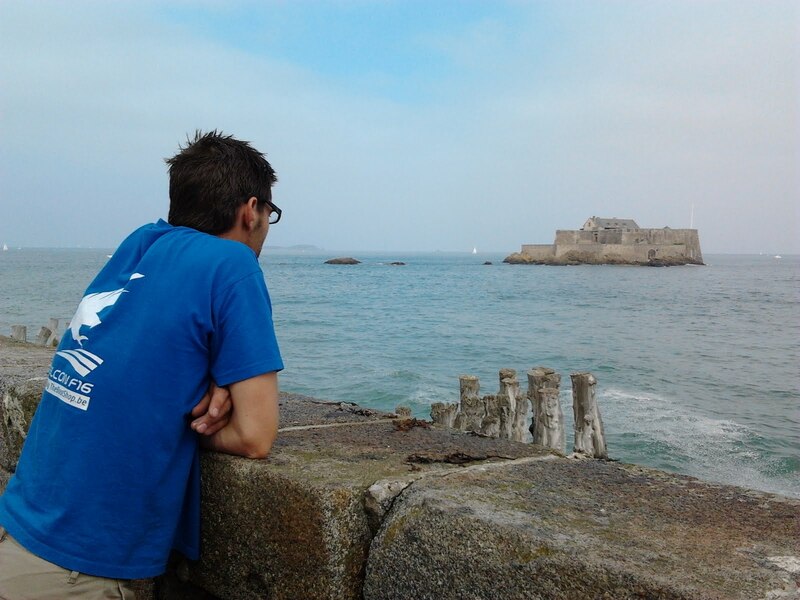 On Saturday morning he felt ok and since the prediction was for light winds we decided to go out. Start was at 12, we were out on the water at 11 to make it in time (we had to sail for about half an hour to the starting area, because of the light wind). The racing committee did a great job and managed to get 3 races in, but it wasn’t an easy job. They had to change course after each race. The wind turned but no real sea breeze settled. We had a lot of shifts and holes of no wind in the racing area. Tactical sailing! In the second race we were in 7th place when suddenly the wind turned and instead of sailing downwind we were faced to drop the kite and sail upwind. Unfortunately 3 other boats who were sailing a bit higher than us could keep their kite up and these 3 boats passed us right in front of the finish. Damn! We finished 7th, 11th and 13th, leaving us on a 10th place overall. We were happy with this result, with these light winds and tactical course we still struggle but we had good boat speed and we didn’t really screw up. Youth team Klaas & Valerie sailed for the first time together (Klaas is normally crew for his brother Arnout Viktor) and they needed some time to get into the groove, but when they did, they rocked. They were very happy to finish race 3 in front of Olympic Sailor Carolijn Brouwer on a Viper, even on corrected time! Great sailing guys! They finished overall on place 9, their last race they were place 4, just behind Wouter Samama, Wim Deca and Patrick Demesmaeker, very happy faces after this great result! 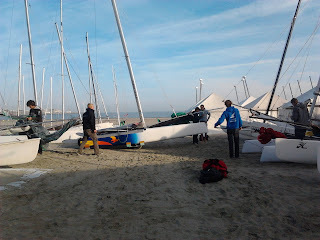 We beached at RBSC Zoute to derig the boats and to put them on the trailer. After the price giving (yes we got another little diamond!) we left for our next race in Oostduinkerke, the Raf Verhaeghe Challenge at Sycod Oostduinkerke.